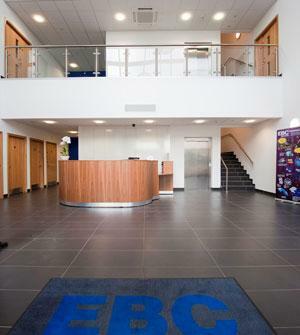 Manufacturer’s of the world’s largest range of brakes, Northamptonshire based EBC Brakes have recently opened their new head office complete with tiled floors, walls, stairs and skirtings. Ceramica Fix Ltd. secured the contract from Warwick Burt Construction and in total 400 square metres were tiled. Existing subfloors were prepared using Ultra Floor Level IT one HDB and Ultra Tile Prime IT FP. Porcelain tiles were then laid to a brick bond pattern using Ultra Tile ProFlex SP in grey and grouted with FlexJoint. Ultra Floor Level IT one HDB is a single part concrete levelling compound for irregular internal substrates. The product has a working time of 20-30 minutes and will set within 2-3 hours. It can be applied at thicknesses from 3-50mm and a 25kg bag covers an optimum 5m² at 3mm. Its formulation is protein and ammonia free, shrinkage compensated and polymer modified. Subfloor preparation also included the treating of the laid levelling compound with Ultra Tile Prime IT FP; an acrylic surface conditioner for improved adhesive bond. Ceramica Fix Ltd. selected Ultra Tile’s cementitious adhesive, ProFlex SP to fix all the tiles. The adhesive’s performance is rapid setting for faster completion, and it accommodates movement due to the product’s S1 classification. ProFlex SP is ideal for use with low-absorbency tiles such as porcelains, and has exceptional water resistance making it suitable for use in wet areas and swimming pools. The tiling was finished using Ultra Tile FlexJoint. This grout boasts a super fine texture, is polymer modified for ultimate flexibility, repels water and will not mould. FlexJoint can be used with underfloor heating and can be used on joint widths from 1-20mm, confirming its suitability for use with large format tiles.